I’ve had my share of Lee’s Sandwiches when I went to school in San Jose, Ca. Their only SF location happens to be situated directly across the best Vietnamese sandwich shop in the Bay Area, Saigon Sandwich. If the line at Saigon Sandwich is too long, Lee’s is a great alternative. But, don’t mistake this sandwich shop with Lee’s Deli, the sub-satisfactory American sandwich chain. Lee’s has more than 20 different kinds of sandwiches ranging from BBQ pork to paté, each costing about $4. If you’re in the mood for sweets, you could try any of the baked goods, the Vietnamese waffles or one of the glutenous rice rolls. The restaurant is much bigger than Saigon Sandwich, and it has a seating area – a big plus for workers in the area who, like myself, avoid eating at their desks. I actually had this very sandwich (pictured above) at the movie theater while watching Eclipse… a perfect combination. Lee’s sandwiches are different than other kinds of Vietnamese sandwiches. 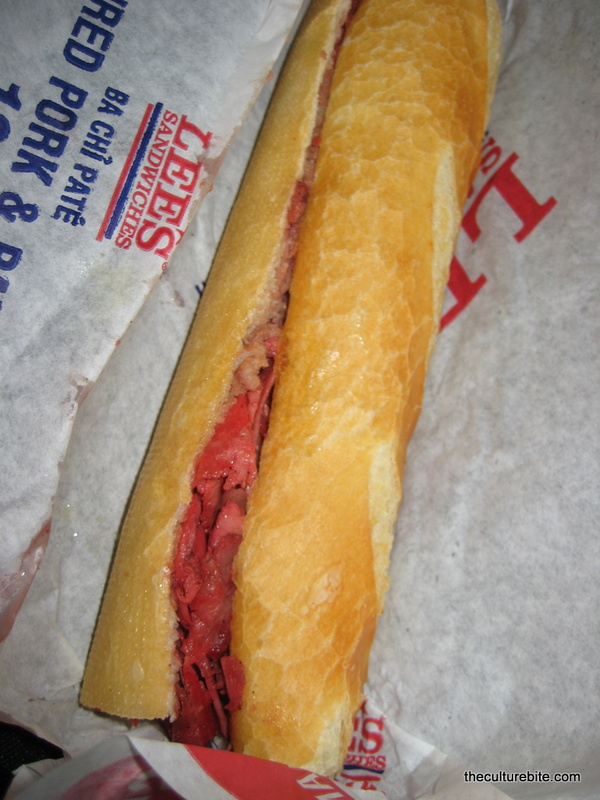 Rather than the round sandwich roll, Lee’s uses a long chewy baguette. Though, the consistency of the bread is the same as other Vietnamese sandwiches. A traditional Vietnamese sandwich contains meat, daikon radishes, carrots, cilantro and jalapenos. I ALWAYS ask for extra jalapenos. Yum. BBQ pork and paté sandwich – In my opinion, this is the best combination of meats. You’ll find the first bite to be orgasmic. The sweetness from the BBQ pork (think Chinese BBQ pork) and the smooth, richness from the patémarry together as a match made in heaven. Really, there’s nothing better. And, this goes for all Vietnamese sandwiches, not just at Lee’s.